Gmail is one of the most popular email services around, and if you use the web-based email client as your primary email app too then you’ll undoubtedly benefit from these three simple tips to boost productivity. No, they won’t end the email onslaught and 100 new email messages a day that we all suffer from, but they will help you get in and out of your inbox quicker in several completely different ways, and that’s a big help. A little progress bar appears in the Gmail composition window as the file uploads as an attachment, when finished send it off like anything else. Standard file attachment size rules will apply. If you don’t use Chrome as your primary web browser, here’s how to get it working in Opera, Firefox, and Safari too. If you think this last tip is goofy, try it out for a week and allow yourself the freedom to just crank out quick one sentence replies rather than paragraphs and paragraphs. If you’re not spending significantly less time replying to and writing emails, I’d be surprised. While we’re on the topic, f you disabled it on your iPhone at some point, I would highly recommend re-enabling it. Got any other worthwhile tips to boost your email productivity? Let us know! Anyone know if the Nexus and Android phones have signatures like that too? Is that a normal thing on all mobiles now? I remember the iPhone email sig was initially almost a snobby marketing thing, but I can definitely see how it would let you spend less time on emails. In my opinion those signatures are only annoying and I only see them as advertisements. I immediately disabled it on my iPhone. I also don’t expect people to use any excuses when they send a short reply. I don’t see a reason why they should use more words than necessary. For me using a mobile also isn’t a reason to send shorter replies. I send short replies from my Mac, but I also send very long emails from my iPhone. I just don’t care which device I’m using. I just say whatever I need or want to say. No matter if I’m using a desktop or a mobile device. All my iOS devices say, “Sent from my mobile device”. That way, it’s universal, it’s not marketing and it’s the truth. If I want to market, I use my gmail at home on my Mac or I launch my gmail from within google chrome on my iPad which has two hyperlinks in my signature. I agree with the “universal” approach. Yes it does but not in HTML simple version. The signature tip is a good one. But any snoopy or suspicious person could view the details of the email and determine which browser sent it. Here’s a tip. Stop using email for one line responses! Especially those that are shorter than your freaking signature. sorry to admit this, but still use AOL as my primary e-mail among friends. 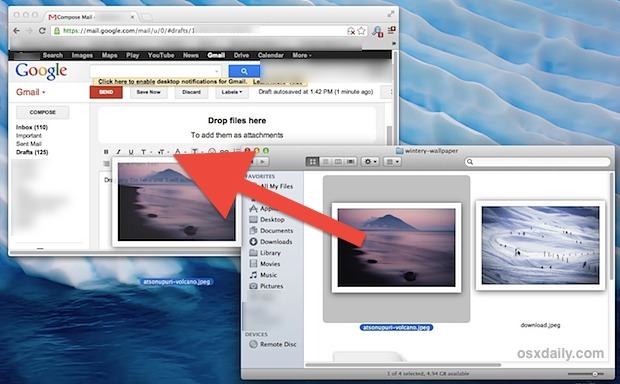 How would I set up AOL as my e-mail client in Safari, similar to what you propose for using gmail?